This is a sample entry from John Payne’s newsletter, This Week in Grain, published on Monday, November 04, 2013. I feel excited to say for the first time in 9 weeks, WELCOME TO WASDE WEEK! 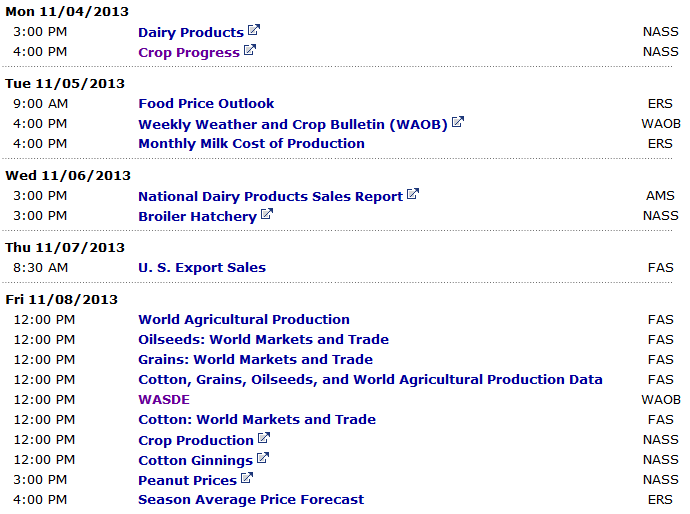 The last time we heard from the USDA regarding WASDE data, it was September 12th. Since that day, we have seen prices move dramatically in grains and oilseed markets. December Corn shed almost 45 cents, November Beans are off almost 1.40 and December Cotton is off 8 cents from the moment the report was released. The good news has been in wheat, with December Chicago Wheat is up 20 cents (was up almost 70 at one point) and KC Wheat has gained 35 cents (was up almost 80 at one point). Keep in mind, the wheat move was made primarily on the back of a very bullish September 30th stocks report, where we saw little new corn or bean data. Regardless, my point for posting these gains is to point out that these markets have moved substantially since the last USDA check in. I am expecting trends to be pushed or changed from the results of this report. Does the market stay inverted after the USDA report and after the November delivery season ends? How much higher does the USDA adjust the 2014 carryout? Does the adjustment offset the faster than expected soybean import pace by the Chinese? Right now China is about 100 million bushels over their expected import pace. If the ending stocks on beans were to be raised 25 million bushels, the uptick in Chinese demand will be somewhat negated. The meal/oil trade structure. This is my gauge for Spec interest in this market. The trade has been long bean meal and short corn for quarter after quarter. This will be our compass. Prices are sitting on a long term trend line that has held multiple times, going back to 2005. If this trend line breaks and we close November around 400, then I think its curtains for corn and we look to test lows from those years. Corn shorts may want to sell some puts down below these resistance levels as a hedge against the trade. Everyone seems to be short corn. ‘Zigging’ when everyone else is ‘zagging’ is usually a pretty good play. With that said, the recent long term moves in corn have come in 4.25 cent moves. The most recent move has only encompassed 4.00 of range. Do we see 3.50 before it’s all said and done? We may, but I wouldn’t expect many to have a chance to buy there as the book ends of recent long term moves have ended with capitulating selloffs/ buys. The Wheat markets may get slightly neglected over the next few days, but we should not be forgetting the seasonal sell signals that come online later this week in Wheat. The Argentinian crop was smaller than expected, but larger than first thought a few weeks ago. Australia seems to be having a decent year and European wheat reports show plantings going smoothly. Watch this spread (July KC Wheat vs Chicago) for direction. A bullish move in wheat should be led by KC, a break of either line should encourage bullish/bearish follow through post report. It’s all about Friday folks. Not only do we have the Super Bowl of grain reports, but we have the first live monthly unemployment number announcement since the shutdown. 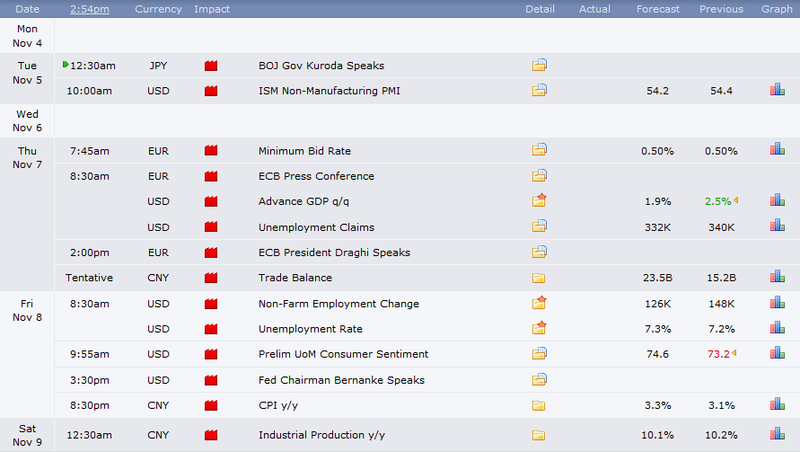 Throw in ECB press conferences on Thursday, Fed Chair Bernanke press conference on Friday and Chinese CPI and Industrial Production on Saturday and we may have the makings for a rocky start to the week, next week. Here is a tip I have been giving my clients for trading WASDE on Friday -trade the report based off how you want to be set up on Sunday night, not how you want to be set up before for the announcement. The major move from the report may not come until Sunday evening or Monday morning after the Asian and European markets have a chance to see the numbers. We will only trade this report for 2 hours and 15 minutes on Friday, without banks being opened in overseas markets. Because of this, I would avoid any weekly puts or calls that expire on Friday. Spend the extra money and give yourself another week to figure out where this thing goes. Stand by throughout the week for more on WASDE and these markets. I am done following the crop progress report; assume corn progress to lag this evening and bean progress to be at about 85%. If anything else breaks before Friday, you can bet your bottom dollar TWIG will be there watching. Stay tuned!